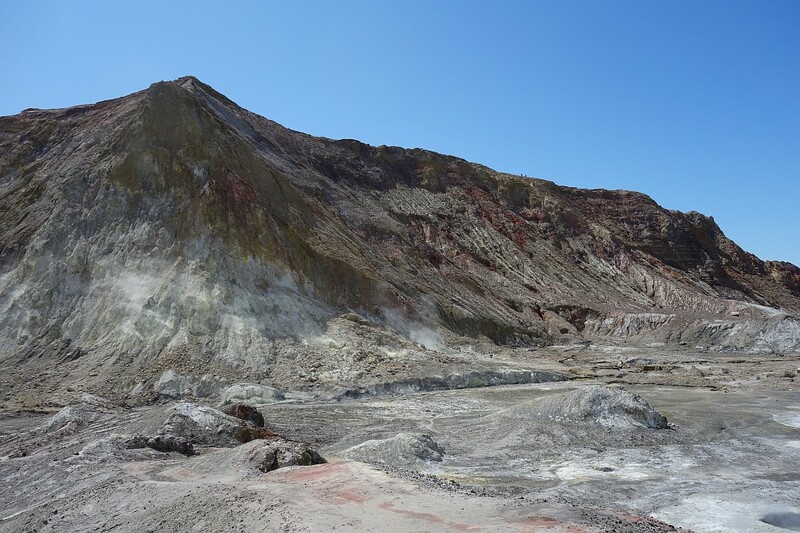 Whakaari / White Island is a privately owned volcanic island in the Bay of Plenty, about 50 km from Whakatane. 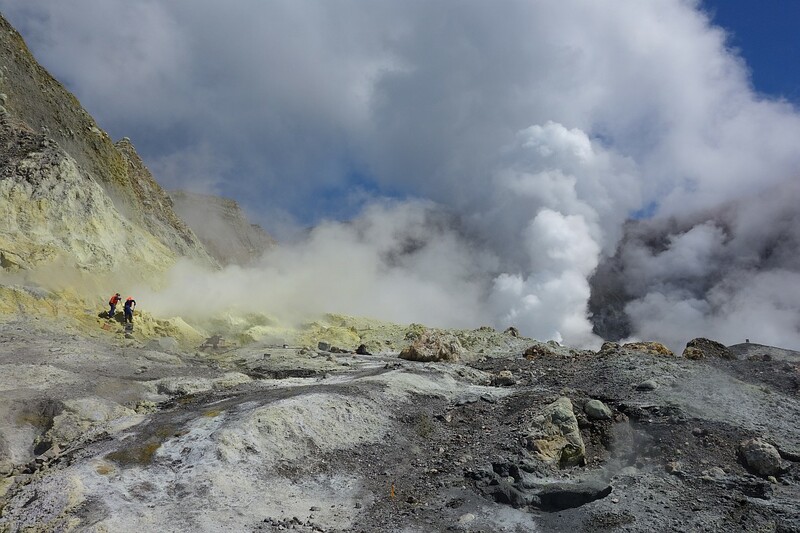 It is one of New Zealand’s most active volcanoes, and is in a more or less permanent state of activity, with occasional extra activity. 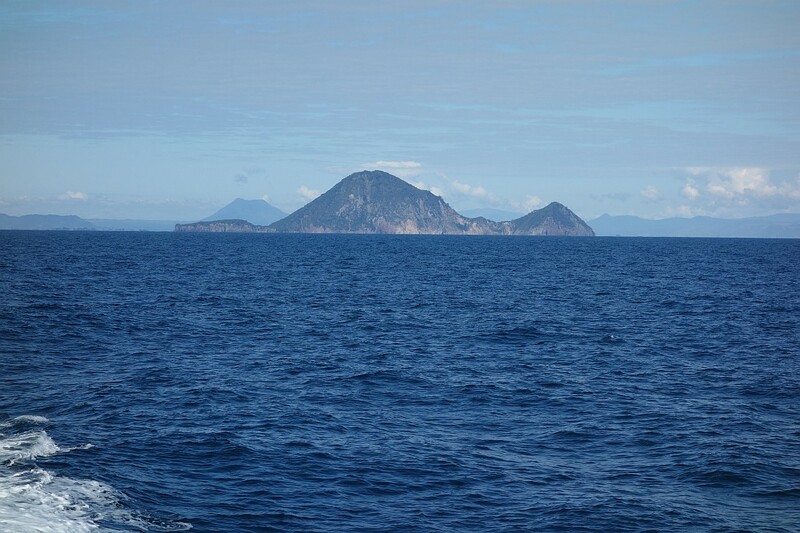 The island is about 2 km in diameter, and the highest point, Mt Gisborne, is 321 m high. 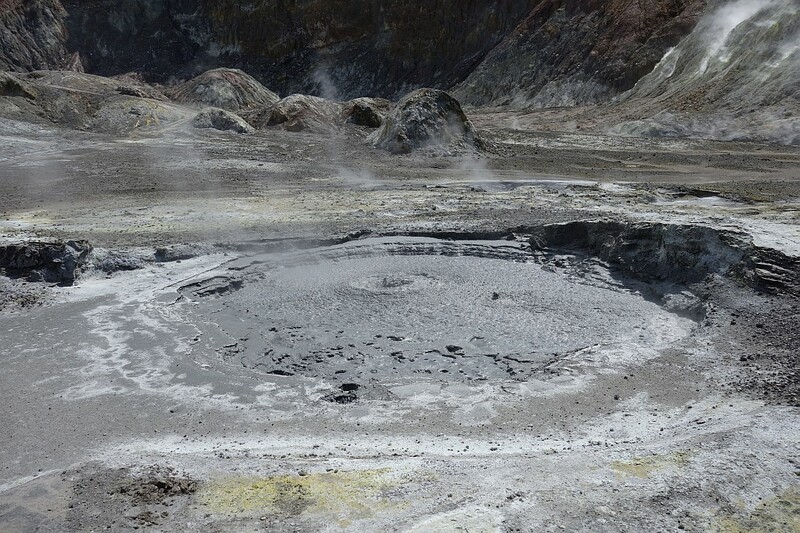 The acidic crater lake is only a few metres above sea level. 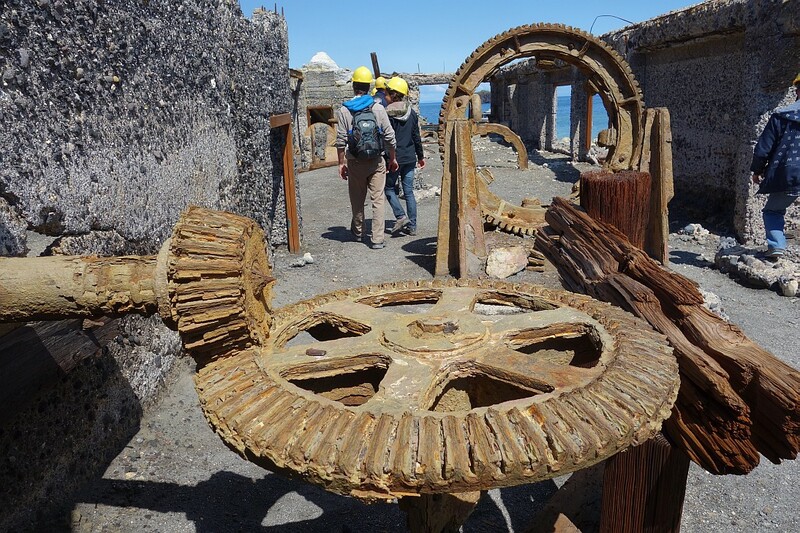 The island has been used for sulphur mining at various times, the last being in the 1930s. 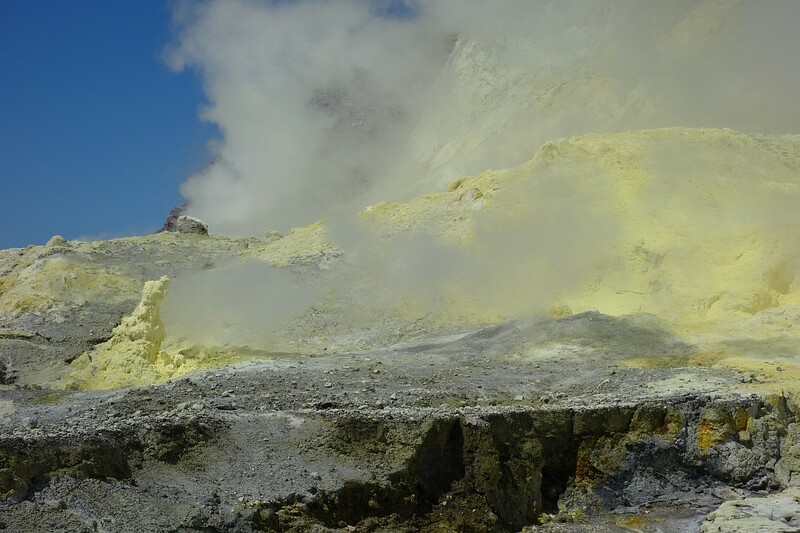 Some attempts have been terminated by eruptions, but the last attempt was terminated due to the insufficient accessible sulphur. 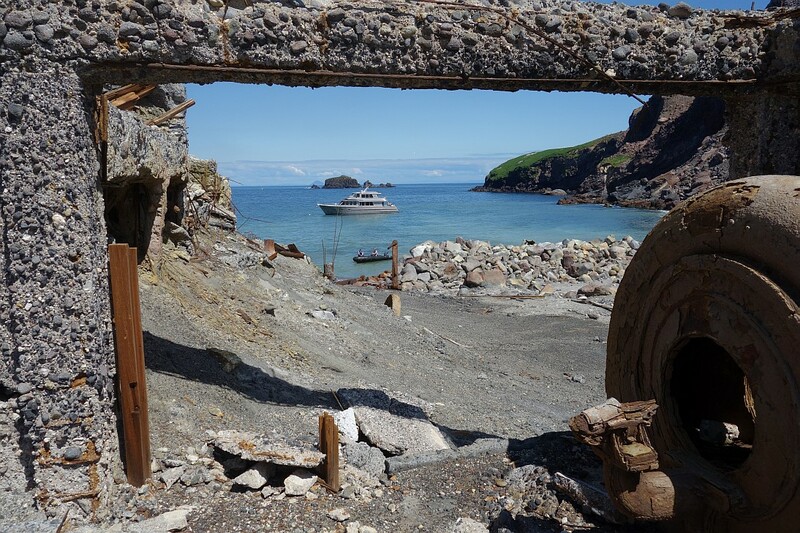 Some remains of the sulphur mining are still present on the island.Several gannet colonies are present on the island, and there is an abundant marine life around the island. 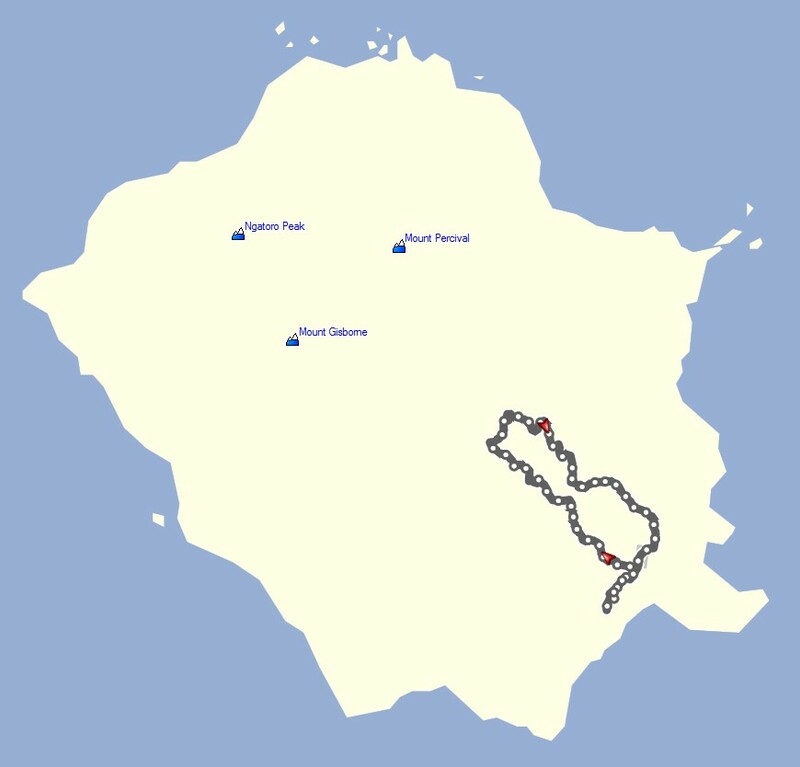 More information on the island and its history can be found on Wikipedia. 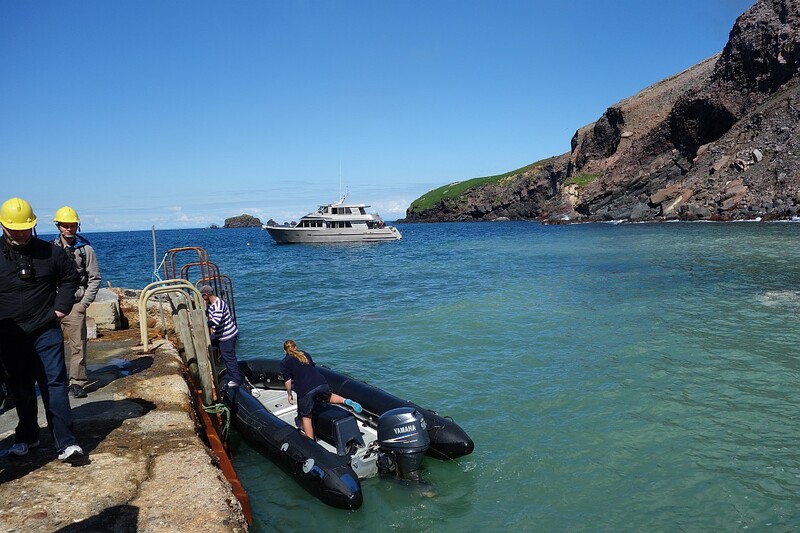 Access to the island is restricted, with strict conditions being applied to the few businesses who have permits to bring tourists ashore. Either by boat or by helicopter. 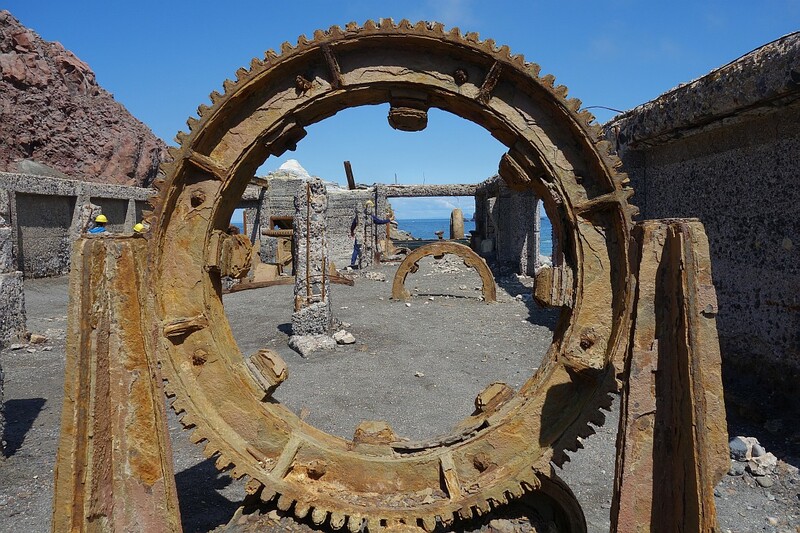 The island is constantly monitored by vulcanologists, and three webcams are permanently stationed on the island. The webcams can be viewed on the web pages of one of the companies providing tours of the island. 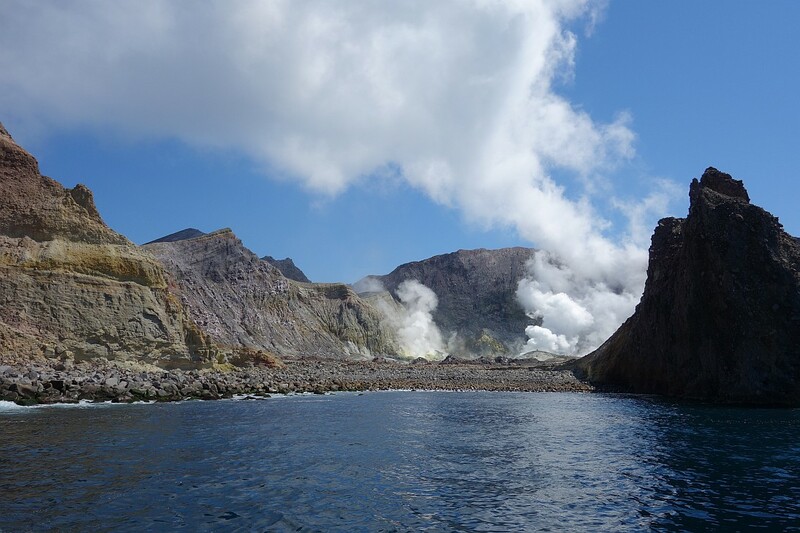 The tour described here was conducted by White Island Tours, using the custom-built PeeJay V to transport the passengers to and from the island, starting and ending in Whakatane. 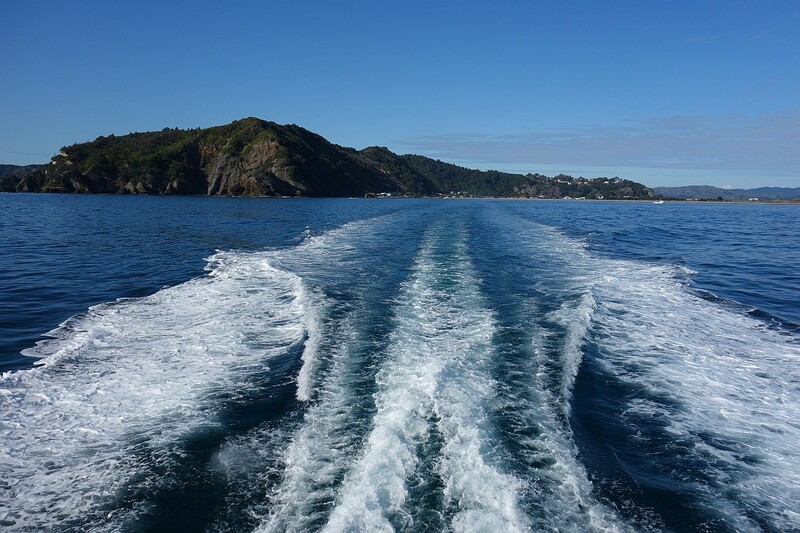 Leaving Whakatane behind, on a perfect early spring day with sunshine and calm seas. 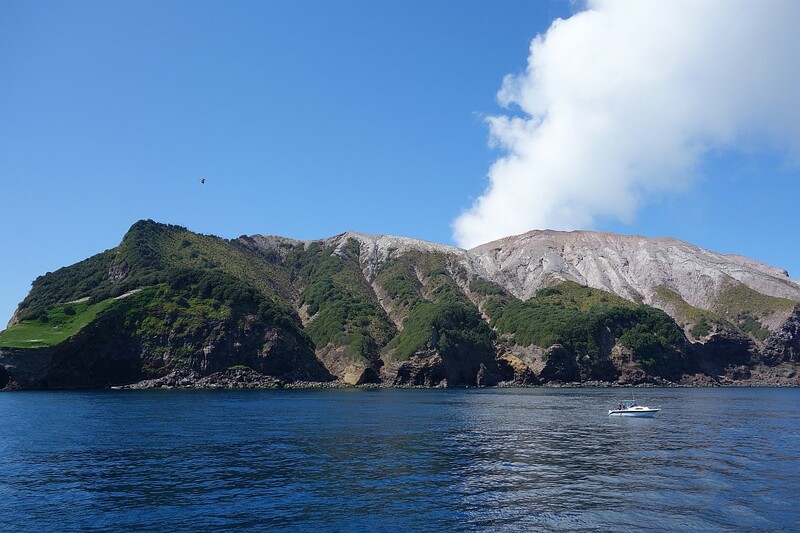 The direct route from Whakatane to Whakaari / White Island passes quite close by Moutohora / Whale Island, another dormant volcano in the Taupo Volcanic Field. Three of the volcanoes can be seen here, with Putauaki / Mt Edgecumbe towering over the lower eastern (left) end of Moutohora, and Mt Tarawera visible in the distance between the two peaks of Moutohora. 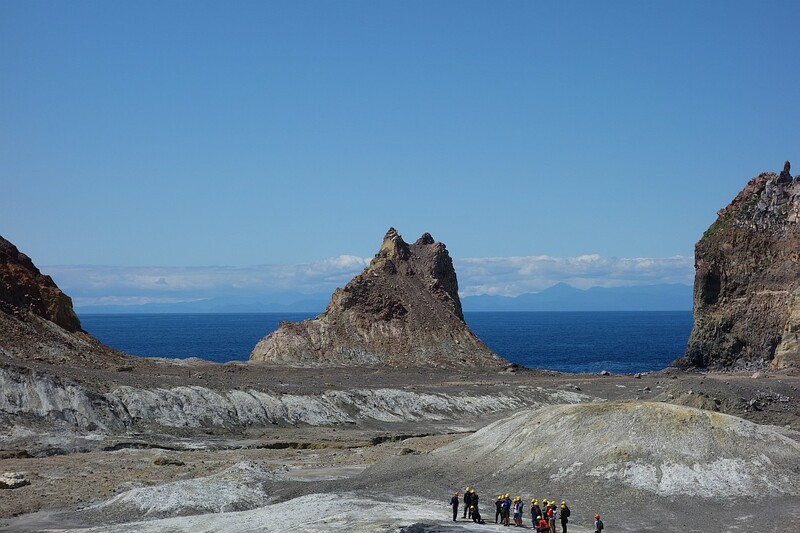 Whakaari is also in line with the other three. 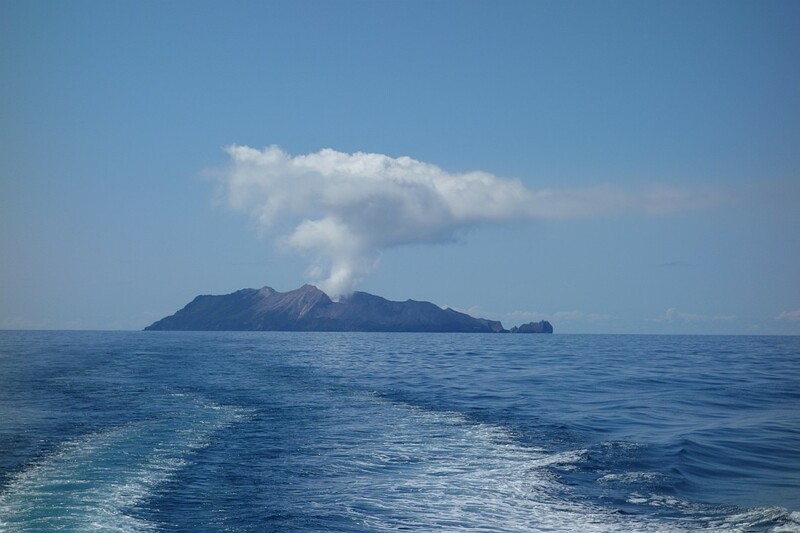 Approaching Whakaari / White Island, which has an almost permanent plume of steam from the active crater. The main island access point is Te Awapuia Bay on the south-eastern end of the island. 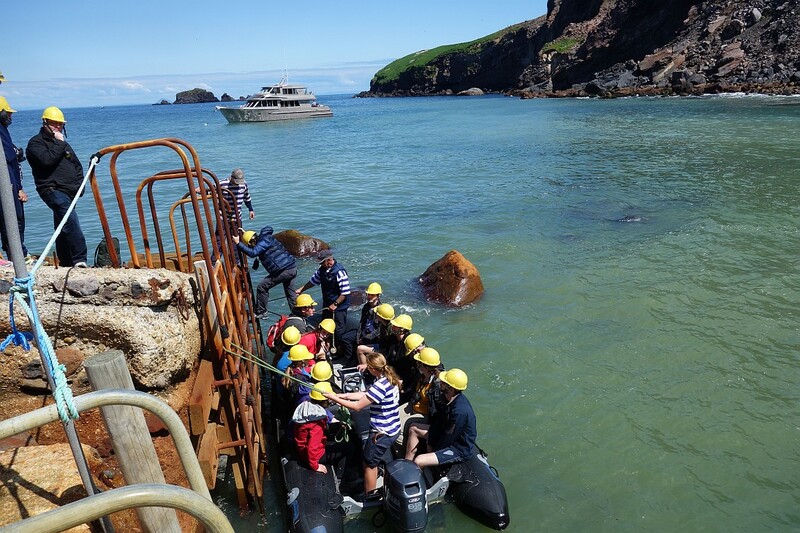 Since there are no suitable wharf facilities the PeeJay V is anchored offshore, and the passengers transported to and from the island in an inflatable rubber dinghy. The wharf from the days of sulphur mining is still usable for access. 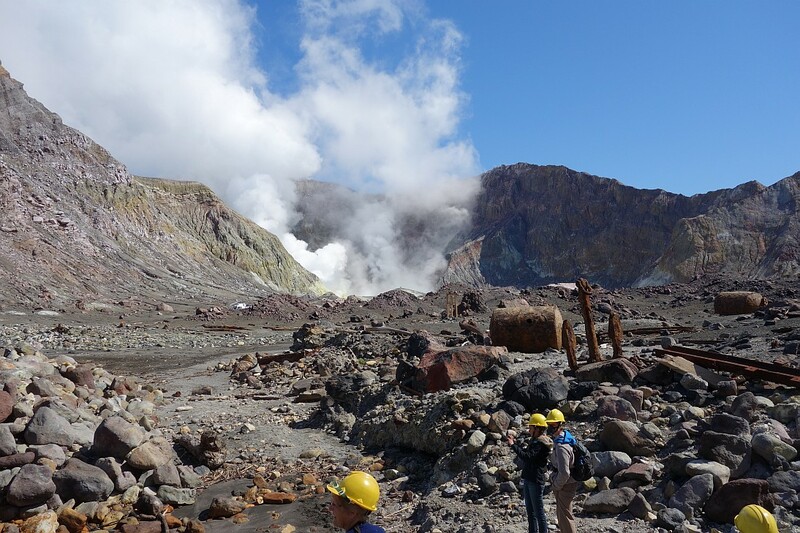 Looking from the wharf towards the main crater. 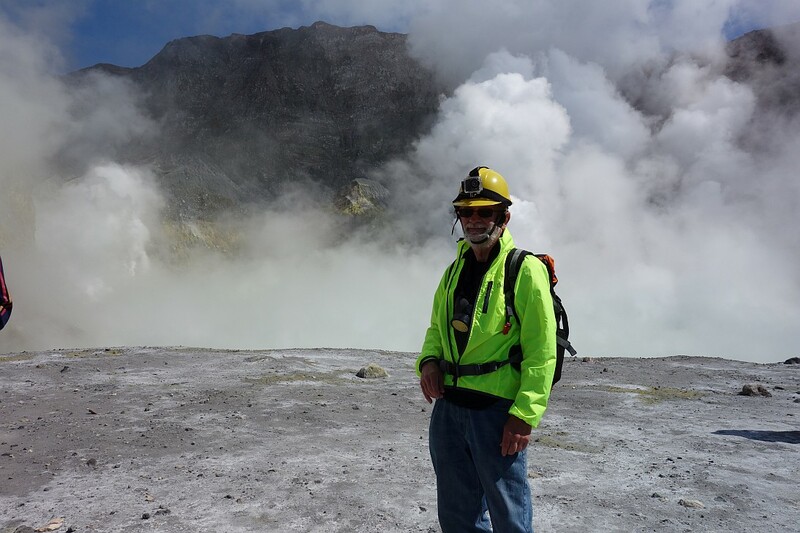 Hard hats are supplied by the tour company, as are gas masks which can reduce discomfort from the acidic steam which may waft past at any time. 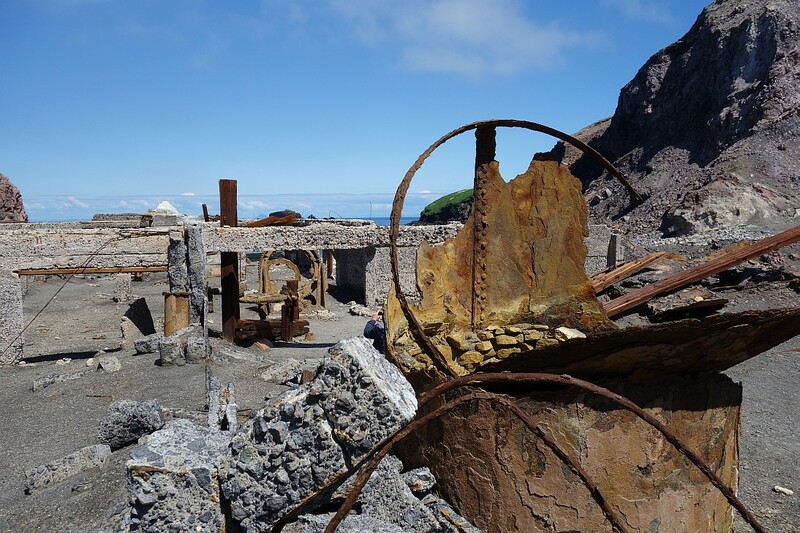 Remains from the sulphur mining operations can be seen here. 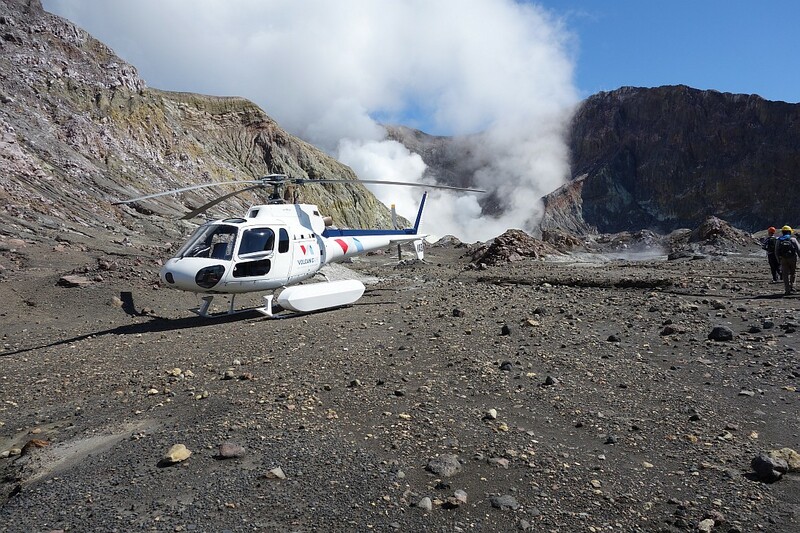 Vulcanologists were working on the island, having been transported there by helicopter. Looking towards the crater, with the first group of visitors on the right. The 45 or so visitors were divided into two groups, each with two guides. Two vulcanologists (on the left) inserting probes into a vent near the crater. 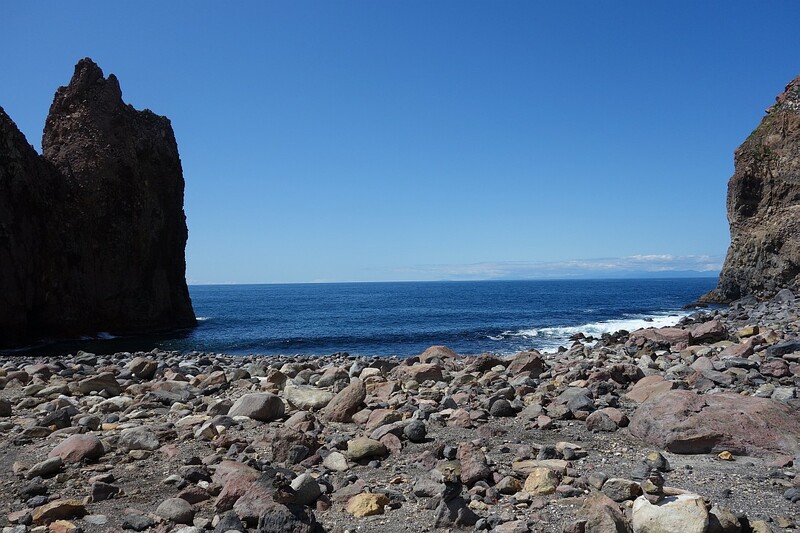 Measurements on site are taken about once a month, while other equipment such as seismic and GPS monitoring is stationed permanently on the island. The seismic monitoring drums are accessible on the GeoNet web site. Pillars of sulphur near the crater. 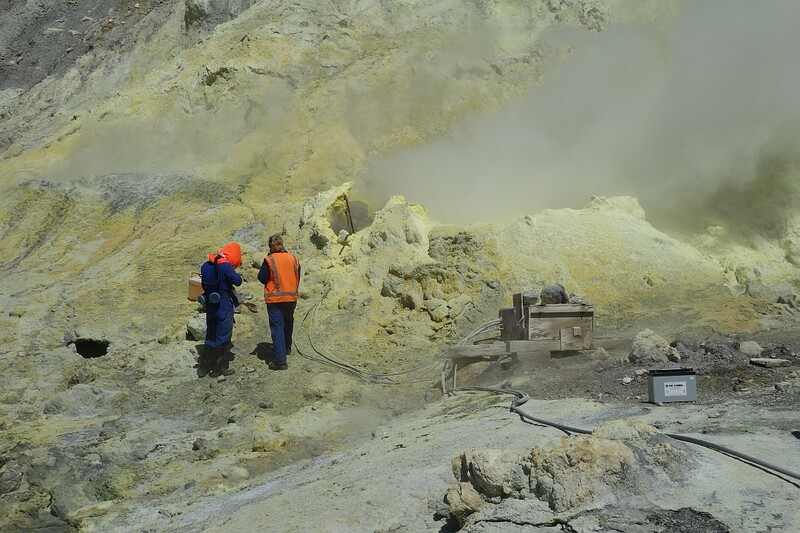 Sulphur is used in several industrial processes, and was previously used as an anti-bacterial agent. 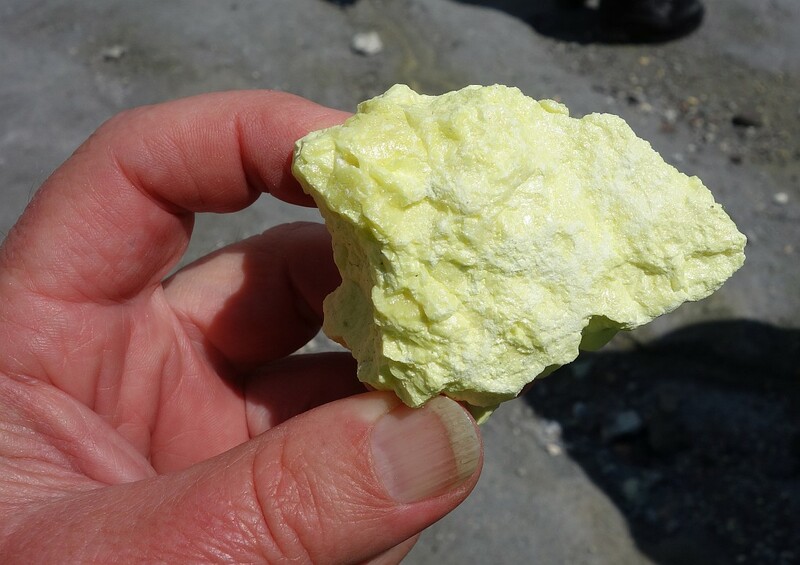 Here a lump of sulphur, which itself has no taste and no smell. 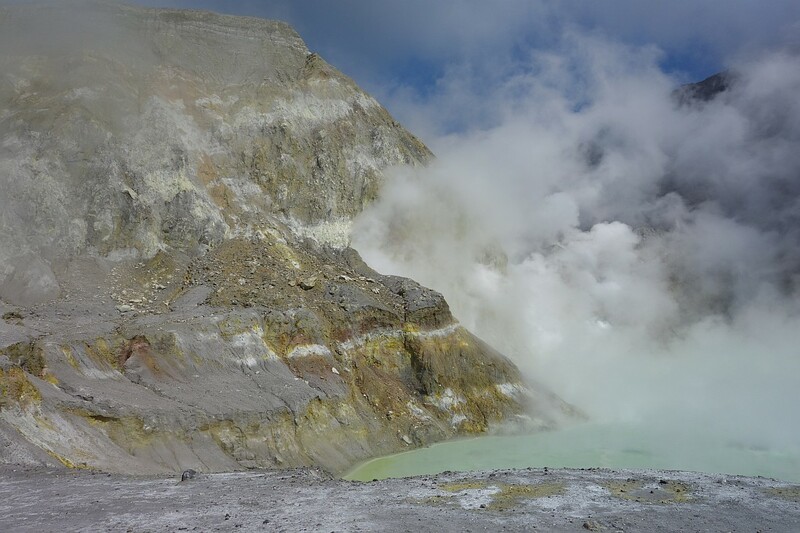 Unlike hydrogen sulphide which has the smell of rotten eggs associated with many geothermal areas. 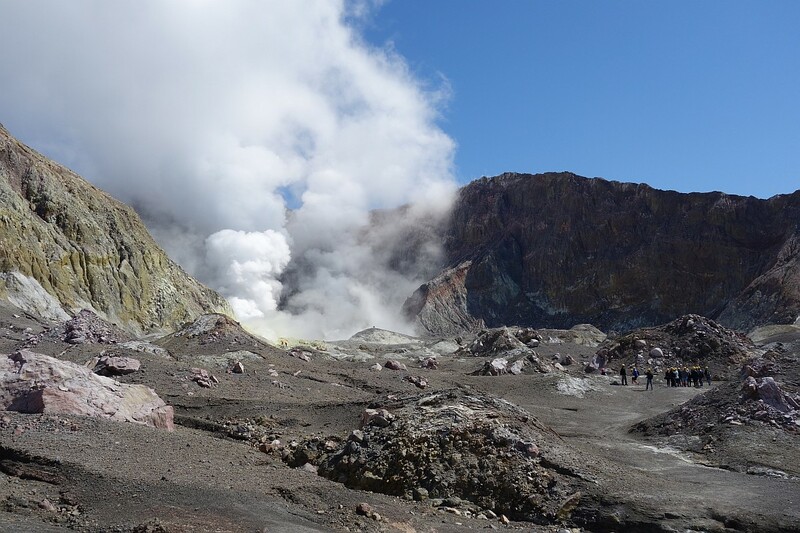 The edge of the crater, with the crater lake visible through the steam. Dressed for the occasion, with hard hat and with gas mask at the ready. The mound with a sign on top used for judging the depth of the crater lake behind it when seen from one of the web cameras. Pinnacle Head in the centre, and Troup Head on the right. 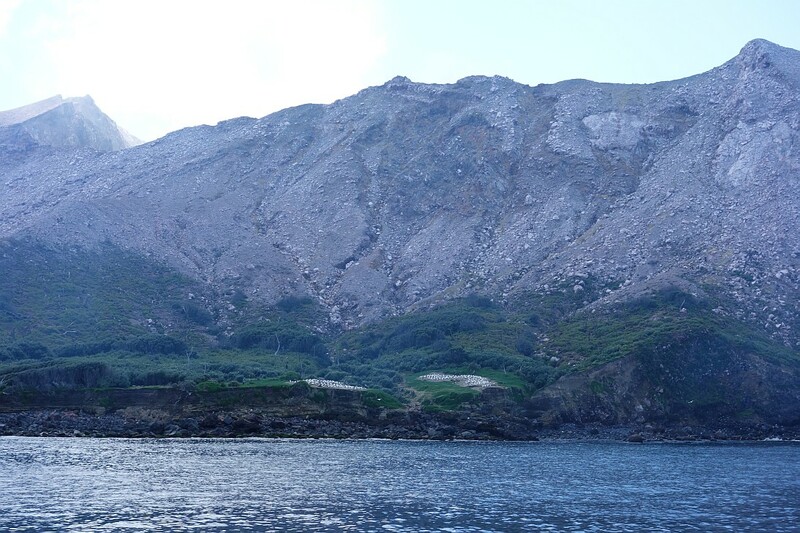 The rocky shore between these two can be used as an alternative landing location when southerly swells make the main landing site unusable. 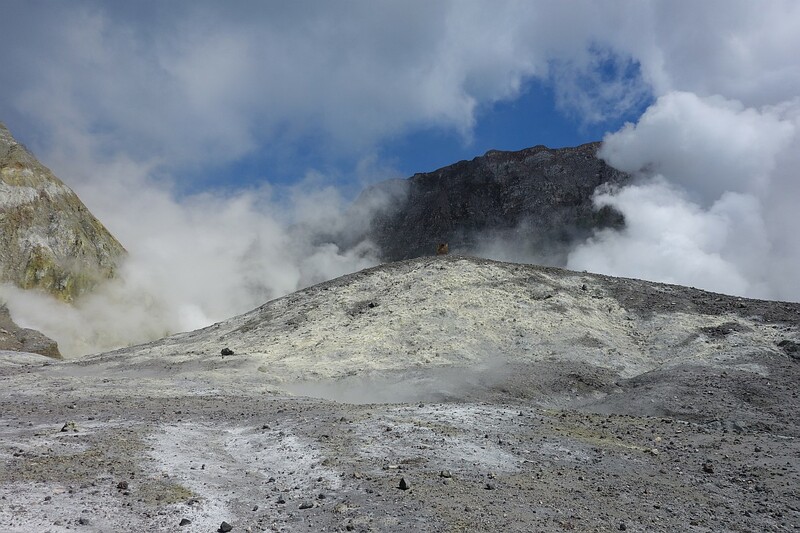 Steam vents are present on most of the crater rim. Steam and gases bubbling up through a small lake of mud. After some time the small mounds in the background will collapse and end up as pools like this one. 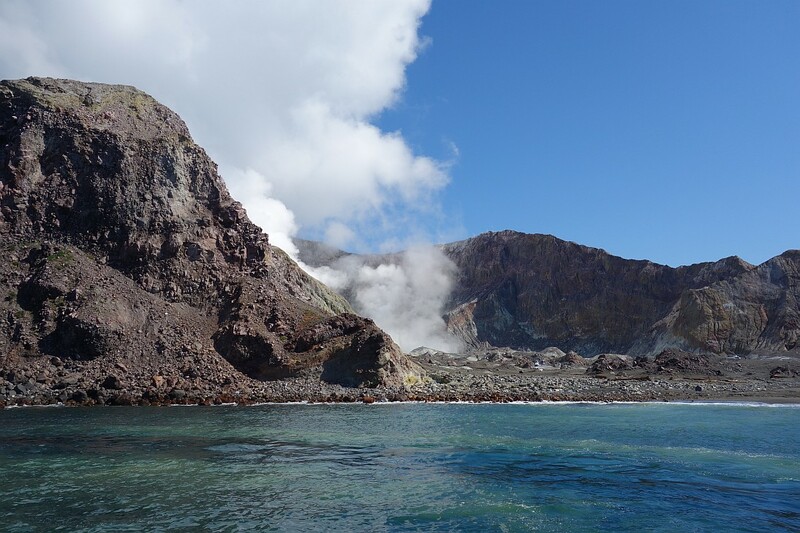 Two small freshwater streams start near the crater rim and run down to the sea. Visitors are invited to taste the water, which has an unusual metallic taste. The alternative landing site, with visitors having to clamber over the rocks to the right. “Dino” achieved online fame when he first appeared on a web camera in 2004. The webcam was moved in 2009, and Dino was moved with it and given a new permanent home. 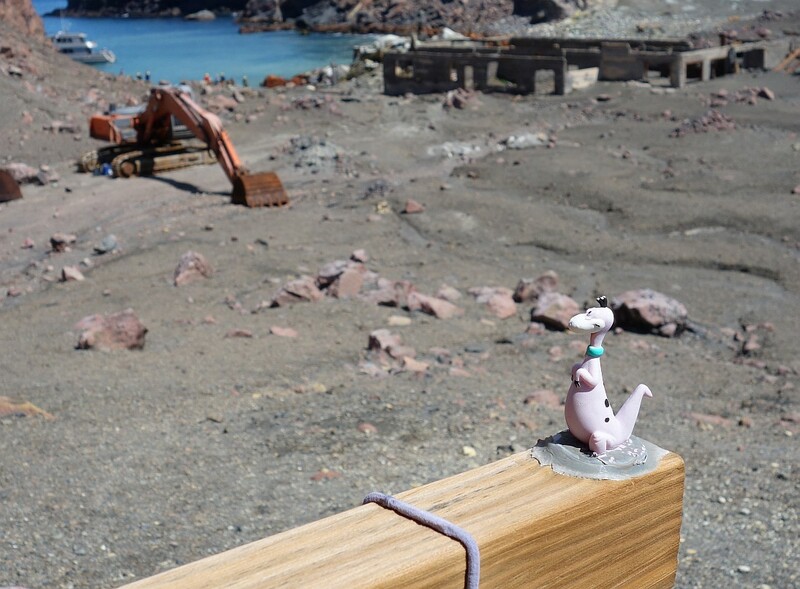 The acidic atmosphere have faded the small figurine, but he’s still visible on the latest webcam shots. 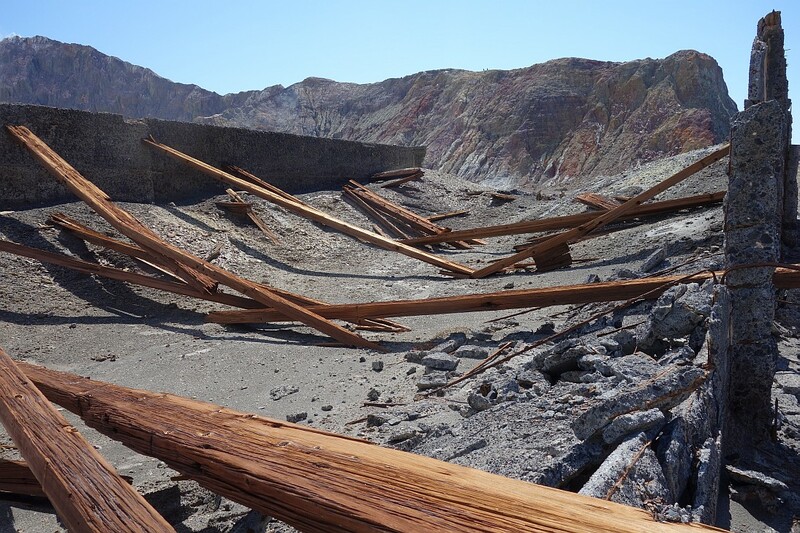 Remains of the sulphur mining buildings. The acidic atmosphere is corrosive, but remains from the mining in the 1930s are still partly visible. 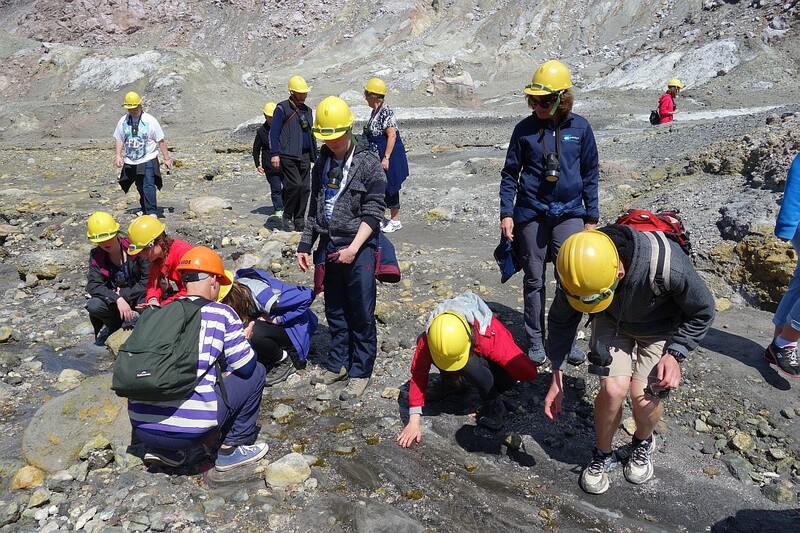 Our guide explaining the sulphur mining process. More remains from the sulphur mining. Ready to return to PeeJay V after about two hours on the island. Looking towards the crater from the alternative landing site. The south-western side of the island, with two gannet colonies clearly visible on the flatter areas above the shoreline. The western end of the island, with another gannet colony on the far left. 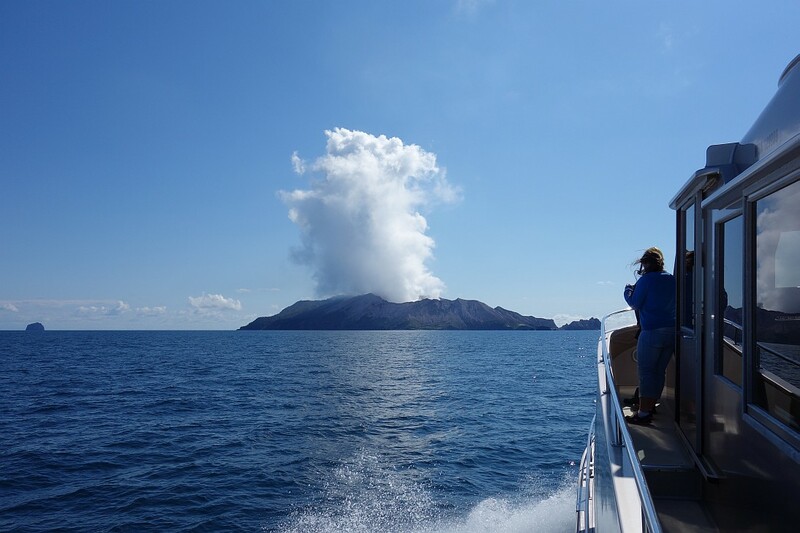 Looking back at Whakaari / White Island, now with a ‘mushroom’ cloud of steam above it. 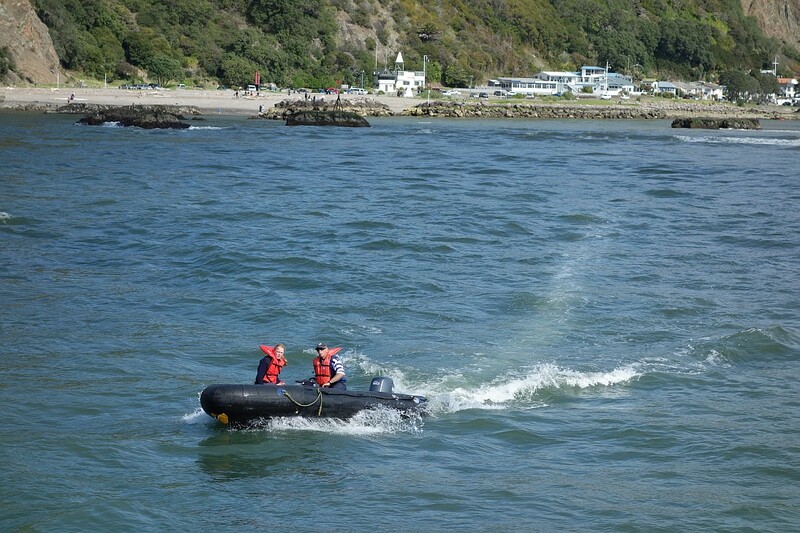 The return to the Whakatane River was at low tide, so the skipper and a tour representative were sent out in the dinghy to gauge the depth of the sand bar. It was touch and go. The two touches on the sand bar were soft enough to allow the go to get us safely off again. 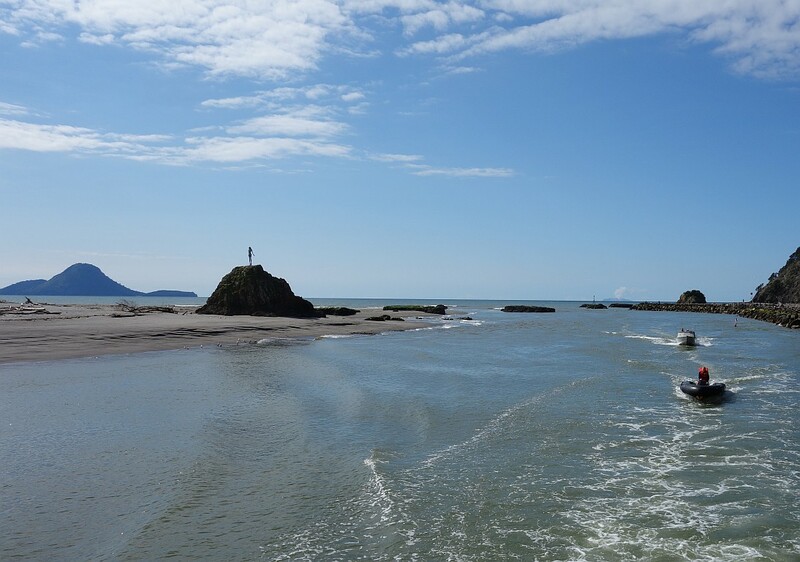 The alternatives would be to wait until higher tide, or have another boat come out and pick up the passengers to return to the wharf on the Whakatane River. The GPS track log shows the walking part of the trip. Total distance about 2.5 km, and total time about 2 hours. The sailing time was about 2 hours in each direction. 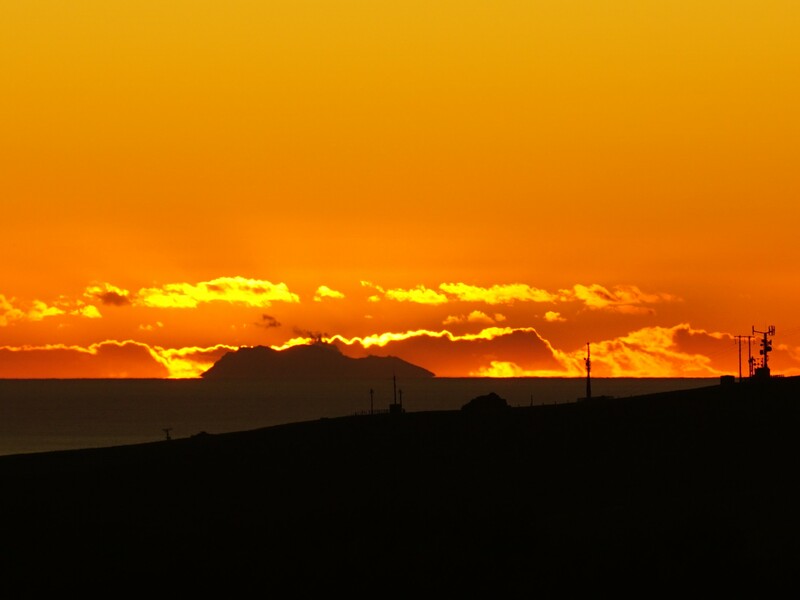 Sunrise over Whakaari / White Island, seen from the hills above Papamoa about 80 km from the island in August 2015. 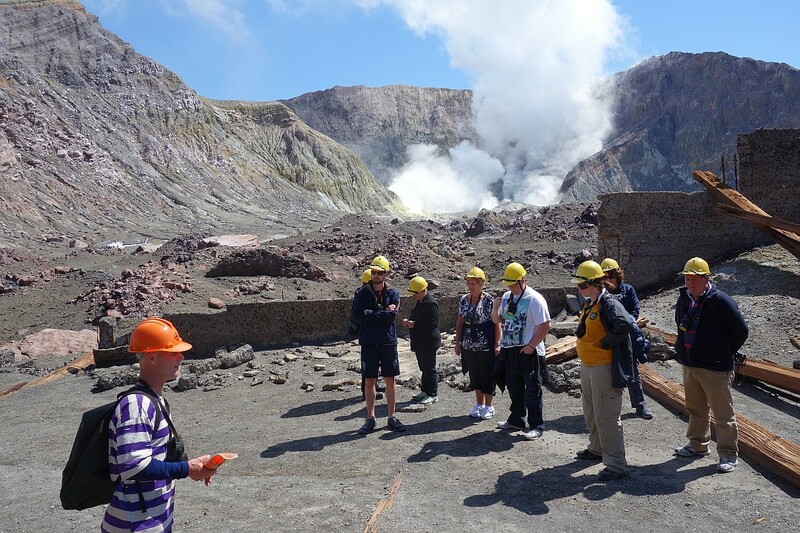 The trip with White Island Tours was taken on September 30, 2015. 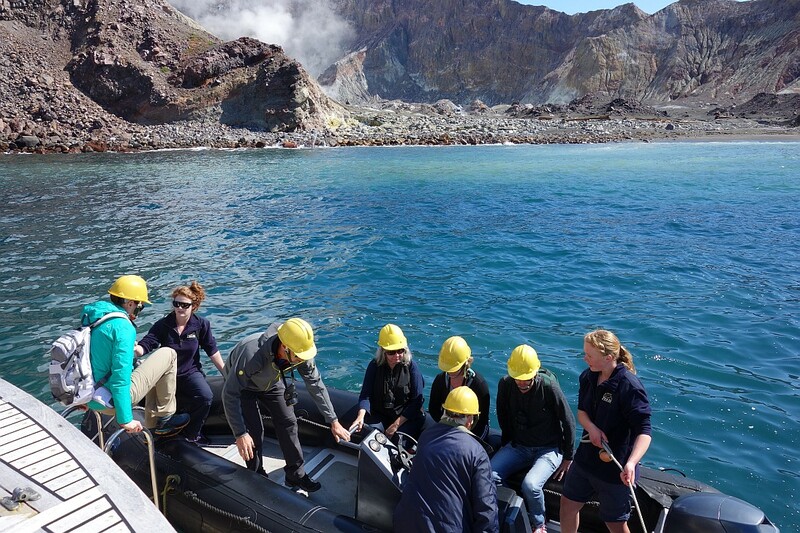 This entry was posted in Walks and tagged Bay of Plenty, Whakaari, Whakatane, White Island on 2015-10-01 by nzartig.